As part of President Obama’s focus on increasing interest in math and science in the United States, various groups of student achievers were invited to the White House Science Fair. Penn Manor’s national and international champion rocket team was one of those groups invited. Nate Bernhardt, Jordan Franssen and advisor Brian Osmolinski had the chance to meet President Obama. 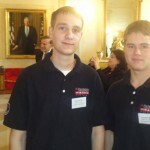 Brendon Stoeckl and Tyler Funk made the trip as well but where not able to meet President Obama. 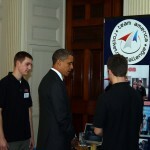 Pictured with President Obama are Nate (left), Jordan (center) and Brian (right). Read the Lancaster Newspaper article here.